MSG is going to be lit! As long as the concept of tag teams has been a part of pro-wrestling, there has always been a precedent set for brothers/family members to partner up together to conquer the tag team scene. The discipline of tag team wrestling requires two superstars who have the ability to gel together creating undeniable chemistry that can help a match flow as smooth as a hot knife on butter. From the Von Erichs of old to the family graduates of the Hart Dungeon. From the rough and tumble Steiner Brothers to the diverse Harlem Heat and finally to the originators of the TLC match in the Hardy Brothers. Brotherhood is an integral aspect of that wrestling formula, so much so WWE projected the idea that Edge and Christian and even the Dudley Boys (carried over from ECW) are brothers. Today whether it is in the confines of the WWE or the vastly changing independent scene, a lot of good brothers battle together hard and strong for tag team glory. That glory finds the new IWGP Tag Team champions Guerillas of Destiny challenged by another pair of brothers. The ROH World Tag Team Champions; the Briscoe Brothers have taken it upon themselves to issue a championship versus championship challenge between the two brothers, now officially set for NJPW/ROH's huge Madison Square Garden show on April 6th. As the brotherhood of tag team wrestling thrives, now is the time better than any to see where the elite (pun intended) pair of wrestling brothers rank today. It is most definitely a strong list if the bottom of the barrel begins with the Lucha Bros. In all fairness, the current Impact Tag Team Wrestling champions haven't had a long tenure in the tag team world as their other counterparts. The two individually broke out as singles characters in Lucha Underground. Eventually, this show brought them and their relationship to the fore, used well by the likes of MLW and Impact where they are/have been one-time tag team champions. Elsewhere, they've also conquered the PWG tag team titles against none other than the Young Bucks. Which brings them to their current status. Once it is up and running, the Lucha Bros shall become an integral cog to the All Elite Wrestling's tag scene. A dream tag team match against the very same Bucks is on the horizon, as they confronted them at the Double or Nothing party and laid down the gauntlet with a thorough beatdown. 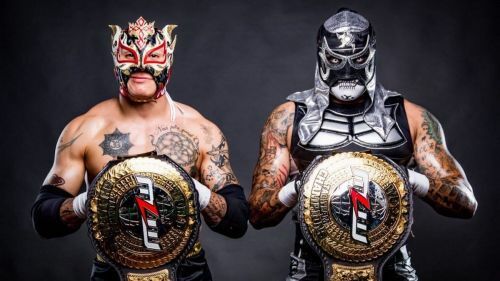 Though the brothers might remain in infamy as one of the greatest tag teams of all pro-wrestling, it's doubtful this sticks as both Pentagon and Fenix are honestly meant for so much more as singles Superstars. Something that can't really be said for the other tag teams on this list. G1 Climax The Young Bucks The Briscoe Brothers Tama Tonga Pentagon Jr.